Chief Justice Mian Saqib Nisar expressed anger on the clothes worn by female stars during award shows. 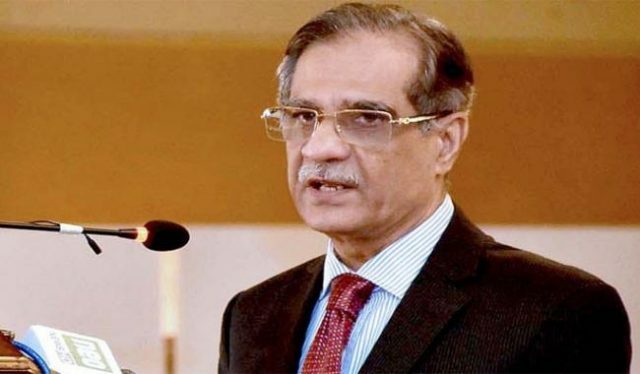 The chief justice raised the matter while hearing the case of Indian content being aired on television channels. Producers and actors were present in the hearing at Karachi Registry of the Supreme Court. They celebrities, in their arguments, said that their employment is affected due to the airing of Indian content in Pakistan. CJ responded that television channels are airing the most inappropriate content. He sought a detailed report on the implementation of law regarding foreign content. He also issued notices to Pakistan Electronic Media Regulatory Authority and television channels.